After some experimental tuning this past spring, the MGM is back on the road. 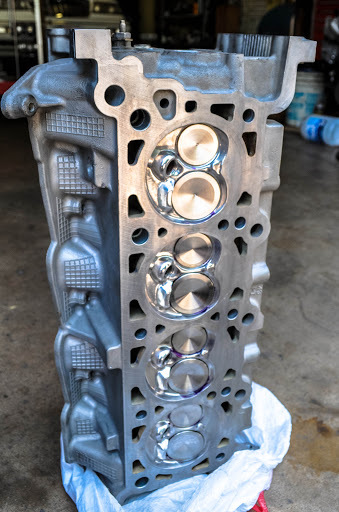 The short block checked out fine but the heads needed some major love. 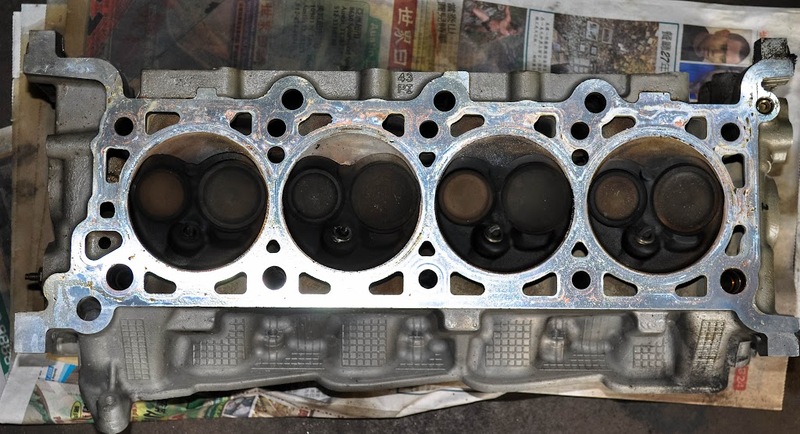 Due to detonation the heads melted a bit, the valves mushroomed, and the spark plugs did not fair well either. The heads were over heated due to detonation. The valves mushroomed and the plug fittings melted. 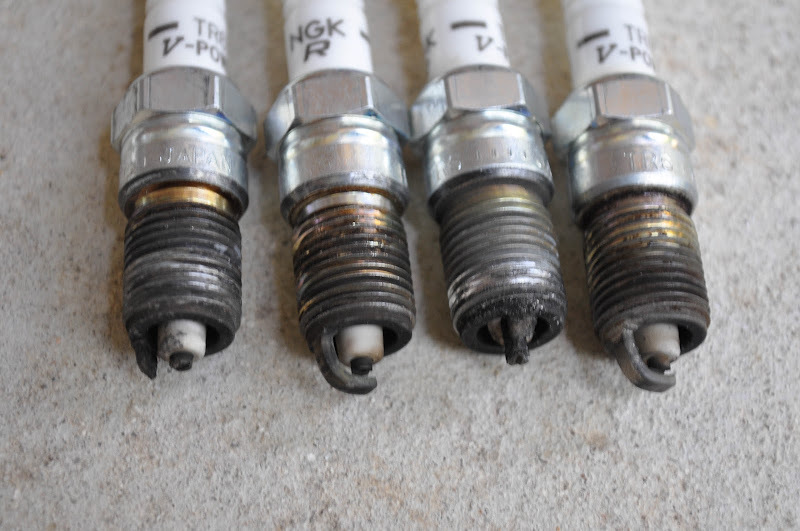 The spark plugs didn’t fair too well. Previous to this build I had been noticing that my power curve was falling off on the top end very early, so an effort was made on this build to correct the power curve. The old power curve previous to this new build. On this partial rebuild I had the heads completely worked over. They were ported and polished. The valve guides, valve seals and so forth were all freshened. I also added stainless steel valves from MMR and Manely valve springs. One of the heads refinished, ported and polished with Stainless Valves and Manley Springs. I also swapped out the 67mm turbo for a 76mm turbo in hopes of moving my torque centric curve into a more balanced setup. The new setup with the Precision Industries 76mm Turbo. The hardest part of this build has been finding a tuner. I quickly learned almost all SCT (the hand held tuner I use) dealers are not actually ground up tuners. They are resellers of “canned” tuners, meaning they use ready-made tunes. I had to scour the Internet, visit shops, converse with car friends and even talk to SCT to find the best tuner around. All signs pointed to Manny over at HPP in Dallas, Texas. Now for those of you who are thinking “at least he’s in the same state,” please remember that it is a 5 hour drive from San Antonio to Dallas. Despite looking for other alternatives, I found none. So I went ahead and scheduled an appointment with HPP. My lovely wife Corina joined me for the trip and my brother Mike stood by with my Lexus GS300 in case he had to come pick us up. The MGM performed flawlessly on the way up getting over 18mpg which surprised me. We spread the trip over two days as to not heat the car up too much before putting it on the dyno. HPP’s facility with their main dragster on the left, a heavily modded Mach 1 and a brand new 2013 5.0 with a freshly installed forged build and huge Kenny Bell supercharger. On the day of tuning things went relatively smoothly. After a slight delay, Manny was working away on the tune, which actually did not take him much time to dial in. On a technical note, HPP informed me that while NGK TR6’s technically work with my setup, NGK BR7EF are the preferred spark plug. So we went ahead and added a fresh set. Once dialed in, I decided I would go for a 15psi tune as that seems to be the safest on pump gas and since I was 300 miles from home I figured that would be a good stopping point for the foreseeable future. 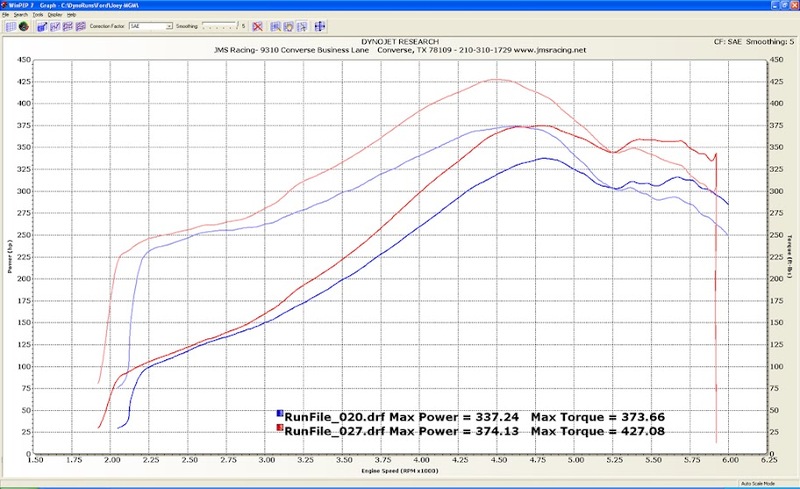 Other then a coupler being stubborn and blowing off twice (once on the dyno and once on the road test), the car performed flawlessly and made over 400rwhp on their dyno which they nicknamed the “heart breaker” because they say it tends to read low. While I do not have a screen grab of the power curve it did improve and now looks normal. I will update this blog when I obtain a copy. After the dyno tune Manny went for a drive with me. Now this is a big deal because most tuners I have worked with have never fully understood the type of shifting I like on my MGM (Save for Lonnie of BOC and Brian McMahan). When I am driving normal I want the car to drive as if it is stock, if not better. The car should shift smooth and at low RPM’s, not hang on gears or randomly downshift or upshift, which if you know about tuning an automatic car tends to be a very big issue. The other thing is when you get on the gas the car should bang away at the gears and really open up. Manny’s tune did all of this without even making an adjustment. I was literally floored, it was unbelievable. I have never had any tune feel so good. Manny smiled and took my compliment. It was great to talk to someone who understood the intent of my car. I am very happy with this build. I would like to thank a few people who really helped me along the way this time. Nicholas Shortridge helped me through this whole build. From towing my car, to helping install parts and give general advice, I would not have been able to do this without him. It’s people like Nicholas that make automotive culture awesome! Also Thanks to Mac Shortridge, Nicholas’s awesome helper. Second Ly at K&C Automotive. Ly is my regular mechanic. He mostly works on Toyotas and Hondas, however when he saw how desperate I was to have someone I trust and is reliable to remove and re-assemble my motor in my MGM he came through. I would also like to thank Zohair at Boost Logic. Along with Marc Evans, Zohair is the one who originally helped me build my Turbo MGM at Boost Logic and when this secondary build came up, he guided and helped me through the way. It was greatly appreciated. He is truly someone that cares about customer service and is someone who I consider good friend. Others I would like to mention are Marc Evans, the originator of my Turbo MGM kit, Kuro “The Kid” Tawil, Chris Adams at ADTR, Ashton at Elite Racing Developments, the crew at HPP in Dallas, Chris Johnson and Omar Izaguirre. This entry was posted in Automotive, Turbo MGM. Bookmark the permalink. Pls contact me at this email address. We would be interested in publishing an updated version of your post, written in more narrative form.